Services: Cable Percussion Drilling, Rotary Coring, Concrete Coring, Trial Pitting, Geotechnical & Environmental Lab Testing, Factual Reporting. Project Outline: One of the largest ground investigation projects undertaken in the UK in 2017 for the Balfour Beatty-Vinci (BBV) joint venture, on behalf of Highways England. The Project involved a pre-assessment site visit, providing detailed risk assessments and method statements for undertaking Cable Percussive Drilling, Rotary Drilling, CPTs, Trial Pitting and Dynamic Sampling within the hard shoulder, verge and adjacent crossings and slip roads between Junction 3 to 12 of the M4 Motorway. 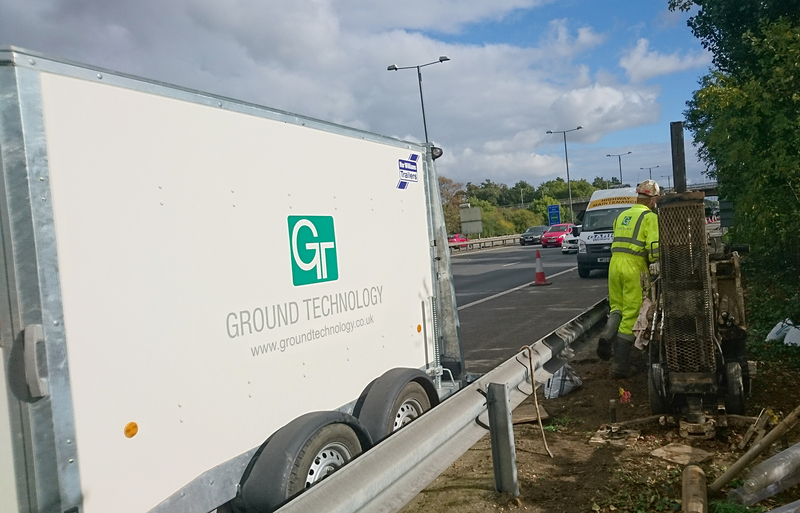 The works consisted of over 400 intrusive locations to provide suitable geo-environmental data to assist the design of major upgrade works for the M4 smart motorway improvement scheme. The work involved drilling in restricted areas adjacent to live traffic during night and day shifts. The works required a high level of communication between the traffic management team, BBV Site Management and our Project Manager. We also undertook the site supervision, logging, geotechnical and geo-environmental lab testing and the provision of a detailed factual report.